This is a wonderful book full of devotionals based on passages from the Old Testament. 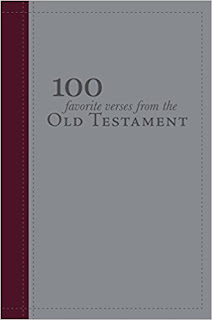 I liked that there is a table of contents listing the topic for each of the 100 verses, making it easy to select a particular passage. The author's credentials are impressive, including seminary teacher and Institute teacher. The style of writing and the messages brought forth are similar to the instruction I received in my seminary and Institute classes- putting the history in context, focusing on a principle, and applying it to our day and personal lives. Often other scriptures and words of our modern day prophets and apostles are included to expound on the topic. While a bit dry, the doctrine is on point and the insights are thought provoking. This would make a great gift with its stitched leather look, silver gilding on the pages, and ribbon bookmark.